In a world ravaged by an undead horde, our last line of defense is held by garden variety plants--with attitude. 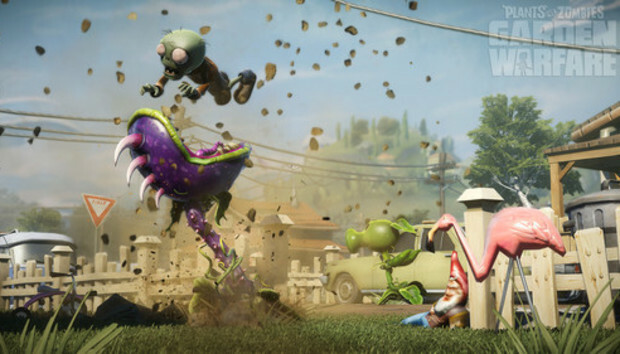 That's the general premise of Plants vs. Zombies: Garden Warfare, the plant-centric third-person shooter we've all been waiting for. At least, I'd imagine that's the story. Developer PopCap Games never felt the need to establish much in the way of narrative for its seminal tower-defense series. And to be fair, Garden Warfare is no less ludicrous than the third-person shooters it expertly lampoons. We got a quick peek at the game at Electronic Arts' E3 2013 press conference on Monday, and it's shaping up rather nicely. If you've played Plants vs. Zombies, the premise will be familiar: zombies attack in waves, and you've got to fight them off. Instead of laying out rows of plants, you'll be scurrying about the battlefield. Yes, the plants have legs. Some suspension of disbelief is encouraged. We saw four different floral warriors in action, all familiar faces to Plants vs. Zombies veterans. The Peashooter shoots, well, peas, and it can drop minuscule versions of itself as turrets to keep the zombie hordes at bay. The Chomper specializes in melee combat--read: swallowing zombies whole. The Cactus serves as a sniper, hurling spiky thorns of death, and the Sunflower will heal her buddies with glorious sunshine and keep them in the fight. This is a huge gamble for PopCap Games, and one that strikes me as just crazy enough to work. That said, we'll just have to wait and see: it'll be headed to the Xbox One and Xbox 360 in the spring of 2014, but may be be gracing other platforms (including its true home, the PC) sometime after that.